Senator Joel Villanueva shone brightest for the Senate Defenders with 26 points. 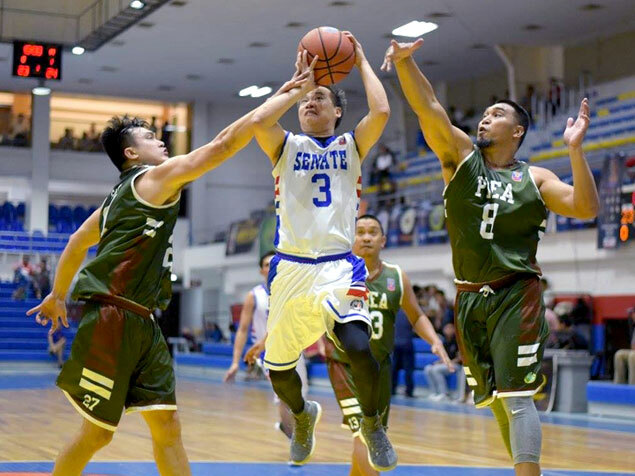 ARMED Forces of the Philippines rode on a big third quarter explosion to snap National Housing Authority’s five-game winning streak with a 96-89 win and clinch the first outright semis berth in the 6th UNTV Cup held over the weekend at the Pasig City Sports Center. The AFP Cavaliers started strong, posting a 25-14 lead at the end of the first quarter before firing blanks in the second frame that saw the NHA Builders take command, 46-39. But with the troika of former PBA player Boyet Bautista, Jerry Lumongsod and Willy Casulla, Jr. making their shots from afar, the Cavaliers regained the lead, 68-63, going into the final 10 minutes of play. By notching their 8th win in nine games in Group A, the Cavaliers advanced outright to the semis of the annual tournament organized by UNTV president and CEO Daniel Razon for the country’s public servants. Though the Builders of coach Benet Palad slipped to 7-2 record, they remained a game ahead of Malacanang-Philippine Sports Commission and idle Judiciary in Group B. The Malacanang-PSC Kamao, on the other hand, outlasted the GSIS Furies, 75-72, thanks to the valiant efforts of Christian Luanzon and Eric dela Cuesta who combined for 33 points. Senate likewise boosted its bid for the other automatic semis slot following a 96-73 win over the also-ran PDEA Drug Busters in the tournament offering P4 million to the chosen charity of the champion team. Sen. Joel Villanueva shone brightest for the Senate Defenders with 26 points.